A few months ago I started picking up books on architecture, urban planning and social psychology and reading them with software design in mind. Christopher Alexander‘s ’77 classic A Pattern Language towers above the others in richness and hasn’t left my bedside. If you’re familiar with the use of design patterns in software development and the classic book on them, the format of A Pattern Language will be familiar: it was its inspiration. Jon Udell and Erin Malone have both written recently on the relevance of A Pattern Language to software design. Also been sifting through books, papers and presentations on neuroscience while thinking about software design. 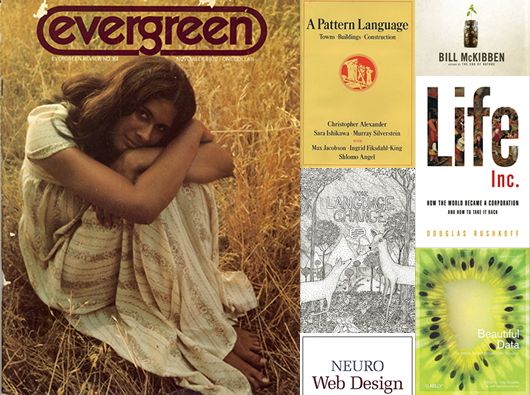 Neuro Web Design distills many of the key lessons from the field into one thin volume. Topics include the power of social validation, building reciprocity and concession, invoking scarcity, using similarity, mass interpersonal persuasion and the power of storytelling. Douglas Rushkoff spoke recently at Etsy on the creation of value and how to exchange it directly with others. His book, Life Inc., has been on my mind since the fall, and helped kickstart a line of inquiry I’m still following regarding the nature of currency. Watch Life Inc. the Movie for an worthy introduction. Stacey Brook also wrote up a recap of the Etsy event. If you’re familiar with the Yahoo Design Pattern Library you’ll be familiar with much of this book: Christian Crumlish is the curator of both. I crack it open regularly, though in some ways I prefer Joshua Porter’s older Designing for the Social Web. See 5 Steps to Building Social Experiences from co-author Erin Malone and the Social Patterns wiki for more. Bill McKibben’s Deep Economy: The Wealth of Communities and the Durable Future is an Etsy Book Club selection. It’s a lucid book articulating the need to explore new economic ideas and create more localized economies. The big idea is that localization is the only way to achieve economic resilience, and Bill makes the case obvious. Been reading up on games and game mechanics for a while like a lot of people (see Amy Jo Kim and my favorite category on Wikipedia), and teaching myself Go, but was unaware of how great Games magazine was (is?) until I came across some early issues circa 1977 and ’78 at an antiques market. In between scholarly articles on ancient African games there are pages of logic puzzles, unusual crossword variants and ads for ’70s classics like Mastermind and Othello—plus the magazine itself is a game, with hidden contests in every issue. NYT crossword puzzle editor Will Shortz was an early contributor. This was a birthday gift from a few years ago, but there’s so much in it it’s still speaking. An extended abstract philosophical discussion among forest animals against a backdrop illustrated with obsessive detail, Kevin Hooyman’s The Language Change is one of the books that doesn’t leave the active stack because I’m still getting my head around it. In “Chapter One: The Animals Speak Amongst Themselves,” a bird asks, “Are numbers real?” A bearded dog answers, “They are useful but they are not real.” &c.
My Piece of the Pie by Donald Brown. This is my grandfather’s autobiography, which I’ve been editing and designing. Family review copies have been circulating and I’m now trying to track down his patents to include them as an appendix. It will be available on Amazon eventually via Lulu. Beautiful Data is a collection of the stories behind elegant data solutions. Almost a book version of the kinds of things I was thinking about when I started working on Datamob, with many of the same players discussing different approaches to tackling the challenges of working with data. Michal Migurski of Stamen Design, whose 2009 Flea Market Mapping presentation still gets me excited, comes through with a detailed chapter on the process of freeing and beautifying urban data. There’s also a fine chapter from Jeff Hammerbacher tracing the history of Facebook’s data team and the evolution of the tools used for information processing at that scale. I spotted a pile of back issues of Evergreen Review circa 1970 and ’71 at the Beat Museum in San Francisco and found them irresistible. I had seen issues from the ’60s but in the ’70s things apparently got a lot sexier. Writing from counterculture greats, beautiful photography plus fascinating ads for underground book clubs and defunct concerns like Truth and Soul Fashions. A new stack is forming now with The Pragmatic Programmer, Stewart Brand’s How Buildings Learn, Carl Jung’s Red Book, Coders at Work, and whatever I can manage to score from the Library of Radiant Optimism for Let’s Re-Make the World.